Noon Rogani is a sweet, cinnamon bread from Azerbaijan near northwestern Iran. What’s unique about it is the shaping — and what happens once the bread is shaped and baked. You see, you make it like a regular dough, sprinkle with cinnamon and sugar, and then form it into a roll. Pretty standard stuff, right? THEN you roll the Noon Rogani beneath the palms of your hands. Remember making long ropes with Play-do? Well, that’s exactly what you are going to do here. You roll it gently until it is five feet long. Five feet! Once it is the length you need you begin twisting the cinnamon bread like you were wringing water out of a towel but very gently. After that it is spiraled into a giant circle and baked. 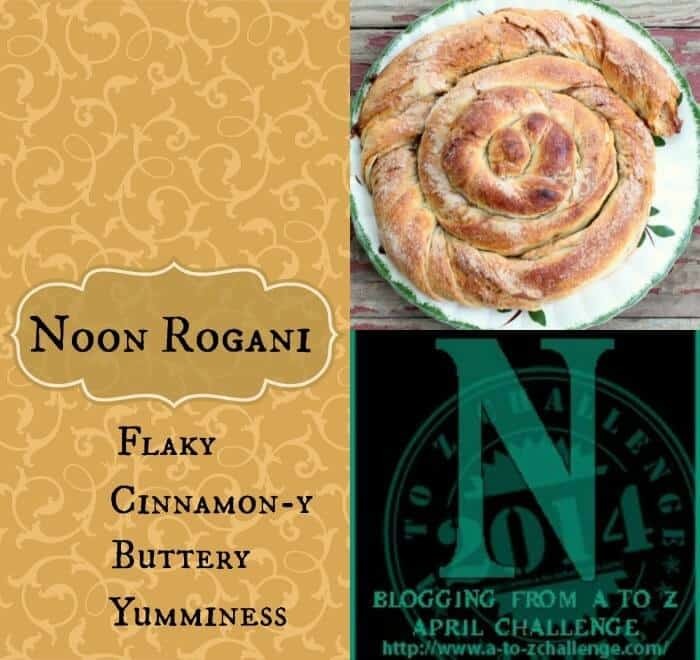 While baking Noon Rogani turns into thin, crispy layers of dough with layers of spicy cinnamon sugar in between them. One thing we did learn is that it doesn’t keep well. Eat it soon after baking. Preferably while still warm. If you like your cinnamon a little on the spicy side always add a pinch of chipotle to the sugar-cinnamon mixture. The smoky heat compliments cinnamon very well. Also, McCormick has come out with a roasted cinnamon that is amazing. Roasting seems to mellow out the flavor and add some depth. How are you enjoying the A to Z challenge so far? I am really amazed that I have been able to keep up. As I write this, and edit my images of my Noon Rogani adventure, I am at my son’s house just on the outskirts of Las Vegas. I’m knocking out work while everyone is asleep — one of the perks of being a freelance writer is that you can work anywhere. We are visiting for a few days and it’s my first time here. He has beautiful views of the mountains and as I have been writing I’ve been watching the full moon set and the sun begin to color the mountain tops a fiery gold. It’s beautiful and I much needed time away from normal life. Of course I am still working but that’s one of the downsides of being freelance writer. If you want to pay bills you take working vacations. Anyway, this bread is fun to make and really good. 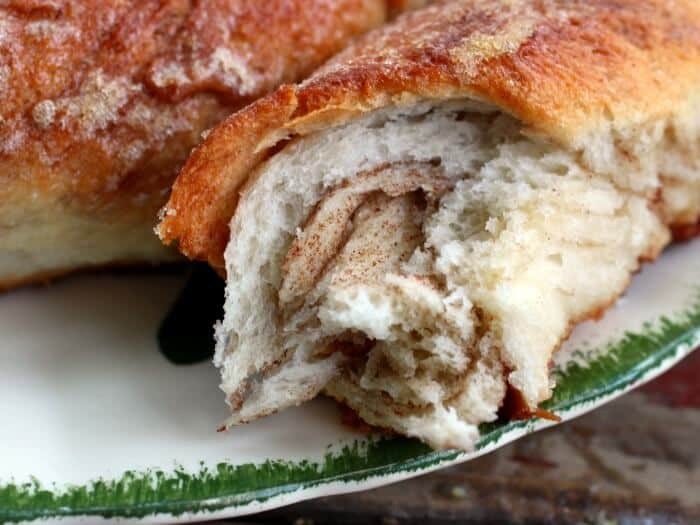 Yes, it’s cinnamon bread but with a nice, little twist (see what I did there?) I adapted the recipe from the King Arthur site but only made a few tiny changes. 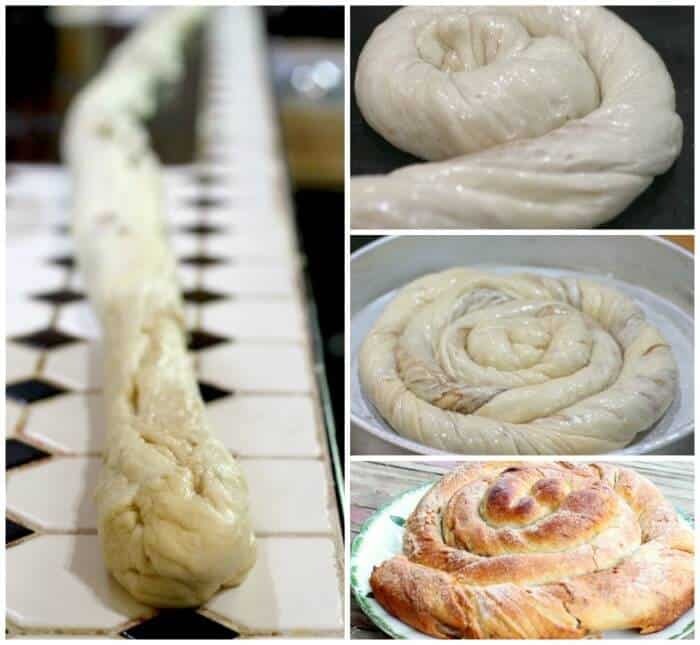 An unusual, flaky cinnamon bread that is formed into a spiral before baking. Break off pieces of the spiral and eat it warm. Mix the flour, water and yeast to a thick shaggy mass in the large bowl of your mixer. Add the salt, sugar, vegetable oil and extra flour as needed to create a dough that is not sticky to the touch but still slightly tacky. Place the dough in a greased bowl, turn over to grease all sides of the dough. Cover with a tea towel and let rise 30-40 minutes, or until puffy. Turn out the dough onto a well floured surface. Gently deflate and shape into a square. Roll the square to approximately 23" square and 1/8th" thick. Mix the cinnamon, chipotle, and sugar in a small bowl. Brush the dough with half of the melted butter and generously sprinkle on the cinnamon sugar mixture. Roll up the dough jelly roll style. Pinch the seam well and continue to roll the rope until it reaches a length of 5 feet. Don't worry about small tears that may occur in the outer layers. Twist the entire length of the rope similar to wringing out a towel, but much gentler and more loosely. On a greased baking sheet or parchment paper, coil the rope into a round spiral, turban style. Don't wrap the coil too tightly, keep the coil slightly loose so that it can rise properly. Brush with the remaining melted butter and set aside, covered, to rise until puffy 40-45 minutes. Bake the loaf in a preheated 400°F oven for 30-45 minutes or until deeply golden brown. Cool slightly on a rack before serving. « Melonpan Is an Unusual Japanese Snack Bread that You’ll Love! Just looking at this is making me hungry! What an awesome treat! I love any kind of cinnamon bread! I do too. Always look ing for new ways to make it! The spiral is such a wonderful shape and to combine with cinnamon is divine.